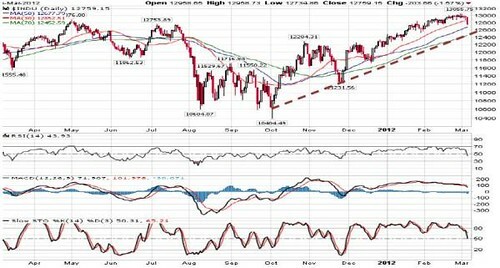 The long overdue pullback had finally arrived as Dow tumbled 204 points to 12759 overnight. The selldown was triggered by potential hard landing in China’s economy, weakening Euro zone PMI and fears of a damaging Greek debt default amid speculation Greek bondholders would avoid a planned debt restructuring scheduled on 8 Mar. A default would endanger debt-laden Italy and Spain. Greece is going to be in a situation where they may default and may drag the other PIIGS. Meanwhile, the VIX, widely considered the best gauge of fear in the market, jumped above 20 for the first time since mid-February.